New In Summer Collections from Nails Inc.
Nails Inc. have recently launched some completely uh-mazing new nail polish shades and effects and I thought it was about time I shared my thoughts on them with you guys. I'm a big fan of Nails Inc., especially when it comes to their new launches, so I jumped at the chance to review a selection of their new polishes, just in time for summer. Nails Inc. have an amazing new range of Festival polishes, Latex Effect polishes, Floral polishes and Special Effects polishes, as well as some 2-in-1 Colour & Pop Art polishes. In short, everything is incredible. Nails Inc. have totally excelled themselves this time, and have released some of the most covetable polishes I've seen for a long time. As is to be expected with Nails Inc. polishes, each and every shade is long-lasting and applies beautifully, and the effects that they achieve are completely show-stopping. I'll give you a little run-down through all the new shades and effects. 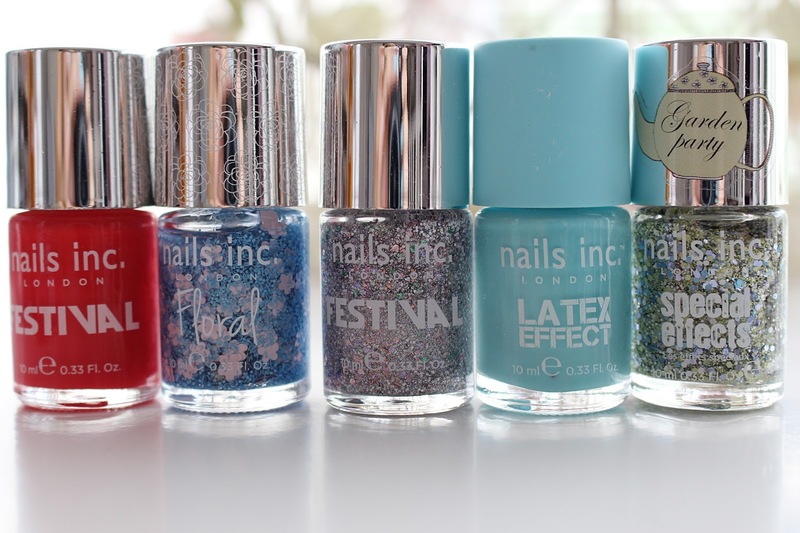 First up - the Festival polishes. Bright, bold, glittery and in-your-face, the Festival collection is perfect to wear if you're heading off to any festivals around the UK this summer. I was sent the shades Hyde Park* (a gorgeous orange-red) and Isle of Wight* (a mass of iridescent sparkles), both of which look stunning after just a couple of coats. The Floral collection has me seriously excited - ideal if you're a fan of floral nail art but don't want the fuss, these polishes blend coloured floral particles together with little flowers, available in four different shades. They look amazing topped over your favourite polish, or can be used on there own if you're happy to load up on 3-4 coats. I got the shade Queensgate Gardens* and it is just the most perfect blend of pink and baby blue. Sticking with all things English garden, Nails Inc. have even released a range of Garden Party polishes, inspired by pastel colours and the English countryside. I received the shade Princes Gardens* and it is honestly one of the most unique polishes I own - such a pretty mix of lush green mossy shades. I also received a new shade from the Latex collection, a collection I was really excited about trying. I received the shade Bermondsey Street* and it is a stunning pastel mint shade. The Latex polishes are amazing as they dry into a waxy latex-esque finish. Whilst I adore the finish of them, I think because of this they are pretty terrible when it comes to staying power. After only a day my nails were horrendously chipped which is really disappointing considering I love the finish and the shade. Finally, the last new product from Nails Inc. 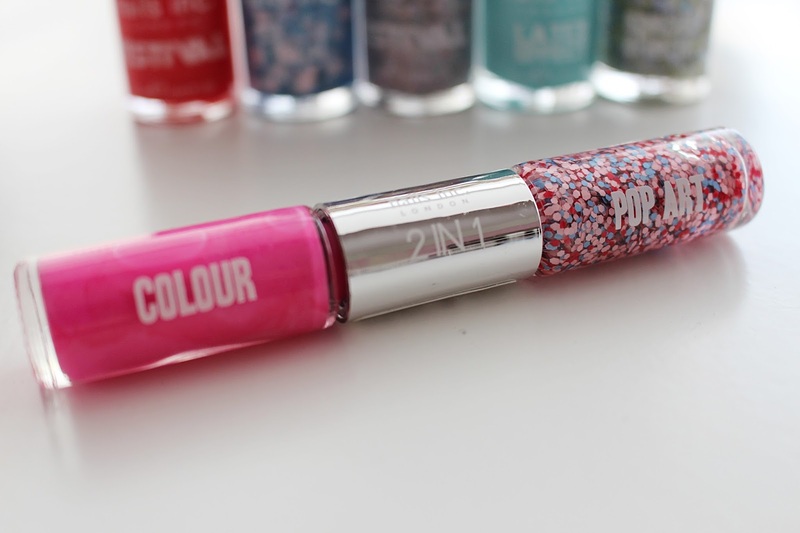 I was sent to try was the new 2-in-1 Colour & Pop Art polish, in the shades Knightsbridge Place* and Sloane Street*. The two colours compliment each other perfectly for the ultimate Barbie disco nails. Overall I am seriously impressed with the majority of the new collections from Nails Inc., although I feel let down by the Latex polish. I'm excited to see what else they come up with in the future. I definitely think Nails Inc. are way above the rest when it comes to releasing new and innovative nail polishes, and these new collections definitely illustrate that. Are you a fan of Nails Inc.? Which of their new collections will you be trying?